1. Young princesses Anna and Elsa of Arendelle are playing in the castle, having fun with Elsa's magical powers, when Elsa accidentally strikes Anna. What physical change is a reminder that Anna was hurt? 3. So, the trolls erase any memory of Elsa's powers in Anna's mind, and the King insists that Elsa can learn to control her power. This results in Elsa being essentially locked away in her room, and Anna wandering the castle, alone and lonely, wondering what happened. Anna mentions in "Do You Want to Build a Snowman?" that she talks to the painting of ________ as makeshift companionship. 6. Anna is smitten with the handsome Hans, a prince from the Southern Isles. How many siblings does Hans have? Hans has 12 older brothers. 7. Elsa's powers come to light after she and Anna get into a fight at the party, and Anna accidentally pulls off one of Elsa's gloves. What were Anna and Elsa fighting over? 9. Anna finds Oaken's Trading Post and Sauna after falling in the frozen lake. She meets Kristoff when he enters the trading post looking to buy supplies, as well as ____________. 10. What does Kristoff do for a living? 12. Kristoff, in disbelief that that Anna would get engaged to a man she met the same day, quizzes her about her future husband. Which of the following does he not ask her about Hans? Anna's answers: "probably John", "sandwiches", "dreamy"
13. Kristoff makes a pretty outrageous claim about all men that Anna finds hard to believe - what? Anna does wind up in the castle by herself, but it's at her request - "The last time I introduced her to a guy, she froze everything." 17. After falling off a cliff onto a "pillow made of snow" when Elsa and Marshmallow the snowman force them to leave the ice castle, Anna is concerned because Kristoff hit his head. He's more concerned about Anna though, and rightly so - why? 18. Kristoff brings Anna to see his friends the "love experts", who happen to be the trolls who helped her as a child. The trolls are thrilled to find he's brought a girl to visit, and point out all of the ways he is a "fixer upper". Which of the following is not one of Kristoff's "flaws" mentioned by the trolls? 21. Who finds and helps Anna after finding her, shivering and cold, in the locked room? 22. 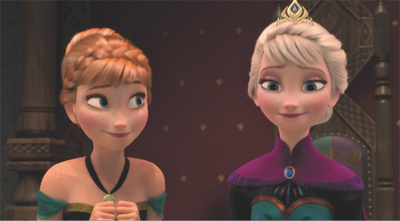 What is Anna's act of true love that thaws her frozen heart? 24. Which of the following does not happen after summer returns to Arendelle?